The FAM, housed in historic Town Hall/ Market House (c. 1816), has been part of the fabric of community life throughout the Fredericksburg area for nearly three decades. It tells the stories of the Fredericksburg community and regions, from the Virginia Indians pre-contact to the Black Lives Matter Movement. Our goal is to connect people to our community’s history. 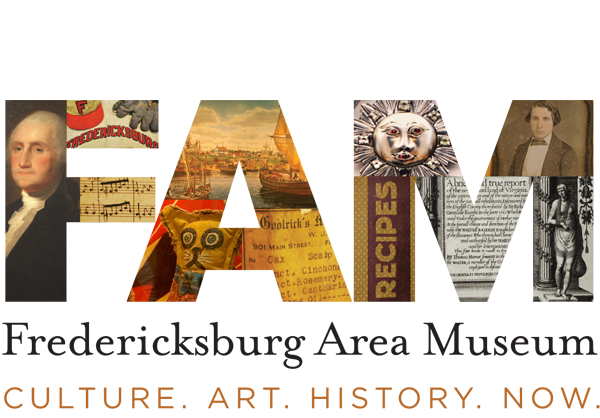 The Museum collects, researches, interprets, teaches, and preserves the history, heritage, and culture of the Fredericksburg region. We serve a diverse community through a commitment to inclusion, integrity, credibility, and relevance. We will facilitate an understanding and appreciation of how the acts of those who preceded us have shaped this community and the nation at large— providing both lessons and inspiration as we work together to forge a greater community. Our vision is to serve our diverse community and its neighbors through a commitment to inclusion, integrity, credibility, and relevance. We will be an institution that facilitates the recognition and understanding of the region’s nation-shaping history through exploration of our past, illumination of the present, and envisioning of the future. For twenty-five years, the FAM has been a steward of our community’s stories, objects, and art. Today, the museum is in an exciting phase of transition. Looking forward to its next twenty-five years, the FAM will focus on meeting the ever-changing needs of the community. While the history of the region is in many ways unique, it is also parallels the history of our nation. The stories told at the museum are the stories of human experience that reach across generations. Our collection will continue to form the basis of our exhibits and the stories they tell. We are eager explore our vast potential as a 21st century museum!